A very rare Dizzy Reece. I'm back after another extended period of not posting. Sorry to keep you waiting. 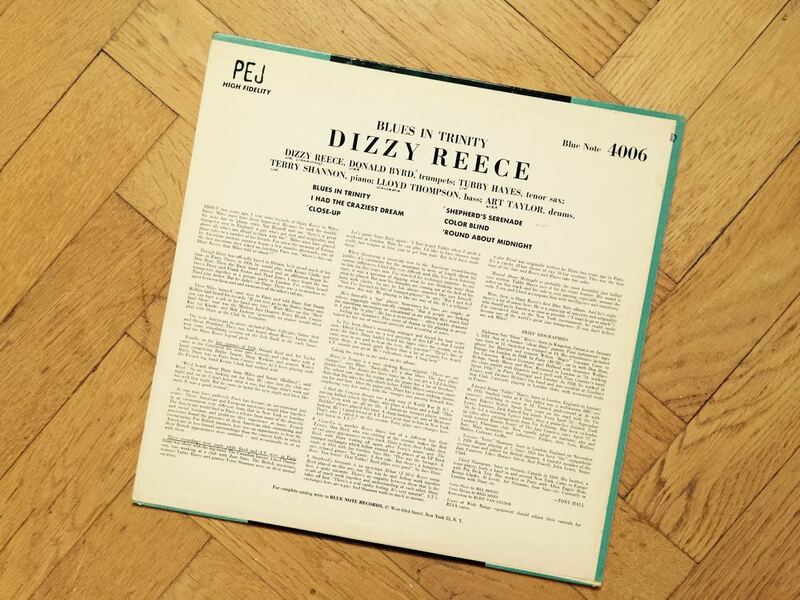 I'm back with this original, 1st pressing gem by Dizzy Reece which is very rare. I very seldom see it for sale in nice condition. I dig Dizzy Reece a lot and I've set myself a target of collecting 4006, 4023, 4033 and 4046 which features Reece and I've now got the first three LP's. I'm very happy about that, as they are quite difficult to find. I hope to be able to add 4046 as well and also the one on Tempo which is almost impossible to find. I'm quite interested to find out what you all think about this LP, or the other ones on Blue Note and if you have any opinions on Dizzy Reece in general. The personnel on this are Dizzy Reece and Donald Byrd on trumpets, Tubby Hayes on tenor, Terry Shannon on piano, Lloyd Thompson on bass and Art Taylor on drums. Very interesting mix of known and unknown (to me) players. Tubby Hayes I know about and is someone I really should look up more in depth. To me, this LP contains all of the ingredients that make up a good hard bop record. A very nice mix of tunes. To be able to have this in my collection and put it on the turntable whenever I like is sweet to say the least. There's nothing like an original Blue Note. A question to you guys reading; do you fancy the Blue Note 1500 series material more or the 4000 series more, or both just as much? For me, I guess the 1500 series are a notch above the 4000 series, but the latter contains a hell of a lot of nice records, for sure. Like this one. If you'd like to see other kinds of posts, where I talk about different things than just posting another LP from my collection, please let me know. Maybe you have certain questions for me or thoughts about jazz in general, past or present? All feedback is welcome. News in the new arrivals department: I just purchased a very, very rare Blue Note that I will be posting here on the site later. A very difficult LP to find as a true 1st pressing which I was lucky enough to acquire last week. Keep a lookout for that. "Patience is the best friend of a smart collector" a friend of mine put it. That's very true for me, as I need to save up for long periods to purchase the high-end gems, and I can't add as many of them to the collection, in let's say a year, as I'd like. But the thrill of receiving these LP's, maybe 5-7 times a year is worth the wait and hard earned cash, believe me. My gameplan, as I think I've mentioned before, is to concentrate on the big game first, now, when I have the funds and contacts and pick as many as I can, cause you never know what happens. The high-end stuff will probably keep rising in price, so before they are out of reach I'll try and get as many as I can. Plus, maybe I'll switch jobs or career path in the future where I will earn less. The kids grow and demand more money. The sources I have will not be around forever either. There's always eBay, and records will continue to pop up there, but the prices will rise I believe, and you need to get the ones you want as soon as possible. I wonder what a copy of BLP 4006 will cost in 10 years in this condition? It will be interesting to follow the market for the next decade. Have a nice Halloween weekend and stay tuned for more nice vintage jazz vinyl 1st pressings from my collection. A truly great and rare vintage jazz vinyl LP. Beautiful is the condition of this copy. An original 1st pressing of BLP 1560 in M-/M- condition is very rare. This copy is superb, the sound is great and the tunes are all hard bop at it's best. I love Philly Joe Jones drumming on this one. He's always great though. This is the legendary collector/dealer Leon Leavitt's own personal copy. An amazing example of a truly great, rare Blue Note. The personnel on this one is stellar, with Mobley on the tenor, John Jenkins on the alto, Donald Byrd on the trumpet, Bobby Timmons on the piano, Wilbur Ware on the bass and Philly Joe Jones on the drums. This is quite a catch and is one of my latest acquisitions. My collection of Blue Notes is growing slowly but surely. Some really big titles has been crossed of the list. This is one of the hardest ones to find and I'm happy to have been able to add this to the collection. I wonder how much this copy would be worth in 10 years. I think all rare Blue Notes are going to rise in value in the coming years. It just feels that way right now. That's not important to me though, as I'm playing and enjoying them just for myself, and I'm never going to sell any of them. Are there any other lucky cats out there owning an original copy of this one? If so, please share. I just received this one and two other extremely nice LP's last week. I've listen to all of them and they are in amazing condition. I will of course put the other ones up here on the site later as well. Stay tuned for more superb vintage jazz vinyl treasures. Unfortunately I haven't got a single person wanting to do the Periscope live broadcast of some record box openings. I guess that Persiscope isn't that well known yet or maybe people just aren't interested in the idea. If anyone wants to do it, respond to this post. I will of course put up the records I have now received on the site, so you won't miss the gems, but it would have been nice to show them first hand to you guys when I open the boxes on live video. If 5-10 people respond to this post today in the next few hours and are game to do it, I will wait with the box openings until tonight, Stockholm time, and we'll do it then. Otherwise you'll see them in the coming weeks here on the site. Allright, let's get into the Periscope thing. I've been thinking about making a live broadcast on Periscope when I receive my three recent purchases and do some box openings and revealing them in front of you guys, live. Periscope is a live video streaming app which you can find in the App Store, it's free. It's working on both the iPhone and Android devices. You'll need a Twitter account to use it I believe. But just create that for watching Periscope, like me. I didn't want a Twitter account but I wanted to watch some guys on Periscope so I created one. Just for watching Periscope, not for entertaning a Twitter page. You can watch me live at given time and see me opening the boxes and leave comments in real time which I can answer and tap the screen to make hearts of appreciation float up at the bottom right of the screen. You can also leave comments for the others watching. All comments written will appear on the screen, for me and everyone else watching. I was thinking, if I get 5-10 people or something who wanna watch this, then I'll do it. I will then announce the time of the broadcast here on the site. Please leave comments to this post if you want to make this happen. Just write "I'm in" or something. I hope we can have a good time on Periscope! Kenny Dorham, one of my favourite jazz trumpeters, graces this rare LP from 1956 on the ABC-Paramount label. A great session. Many fine tunes. You gotta love "Don't Explain", Billie Holiday's beautiful ballad. I also highly dig the opening tune "The Prophet". This album is very rare. Quite seldom comes up for sale in acceptable condition. If you see a copy and are able to buy it, don't hesitate. If you dig Kenny Dorham this is a must. I've always had a sweet spot for him, dating back to, I guess, the first time I heard Quiet Kenny, which is his masterpiece, I think. This album is one of many great Dorham records. I have far from all, just a few. I'm quite keen on the one on Jaro for example. I'll be looking for that when the oppurtunity comes along and I have the money at that particular moment. That's the thing, I think I've mentioned this before: You have a list of highly desirable albums which you would want to have, but you don't always have the cash at that moment when it pops up, or you have the cash, but are in the middle of saving up for a higher priced item which you have promised someone you will buy at a set moment. There's so many great albums I want but you have to take these rare pieces one at the time, and decide which ones you want the most, and which are available. To resist temptation everytime an album pops up on eBay maybe. To continue save up for the ones you've picked to buy from a source and not get too eager and splash out some cash on a few lesser priced but desirable items. It's difficult to master, when you are always on the hunt and following eBay and other places, to keep your sanity and be cool and buy the stuff you've set out to do. Difficult to resist temptation when you also know how rare certain great albums are and how seldom they come up for sale, even the low or medium priced stuff. I tend to look for what is available at my sources and make up my mind on a few that I will buy one after the other, when I've saved up the money. But during the "saving up" time, which can be quite long periods due to the money it takes, I look at eBay and other places of interest and get tempted every week. So, the tempation to aquire a piece which your money can buy then and there is hard to resist. When you try and get the high-end quickly, like I do, the waiting can be tireing. I need my fix, you know? I guess it would be easier if I collected the lesser priced items for, let's say a year. Then I would end up with a hell of a lot more records and less time waiting between purchases. But I believe the really rare high-priced items are only going to rise in value each year, and I want to take some off the market before they are out of my reach. I'm rambling, I know. But I hope you could understand some of what I wrote. Allright, let's get into the Periscope thing. I've been thinking about making a live broadcast on Periscope when I receive my three recent purchases and do some box openings and revealing them in front of you guys, live. Periscope is a live video streaming app which you can find in the App Store, it's free. It's working on both the iPhone and Android devices. You'll need a Twitter account to use it I believe. But just create that for watching Periscope, like me. I didn't want a Twitter account but I wanted to watch some guys on Periscope so I created one. Just for watching Periscope, not for entertaning a Twitter page. You can watch me live at given time and see me opening the boxes and leave comments in real time which I can answer and tap the screen to make hearts of appreciation float up at the bottom right of the screen. You can also leave comments for the others watching. All comments written will appear on the screen, for me and everyone else watching. I was thinking, if I get 5-10 people or something who wanna watch this, then I'll do it. I will then announce the time of the broadcast here on the site. Please leave comments to this post if you want to make this happen. Just write "I'm in" or something. I hope we can have a good time on Periscope! Cheers. Never ever buy from an unknown eBay seller, if you don't like nasty surprises. Well, that's my advise. I usually don't buy records off of eBay from sellers unknown to me. I just got home a couple of 10" LP's. One was advertised as NM unplayed and the other EX on the vinyl "beautiful condition". Let me tell you, I listened to the first track on the "unplayed" one and there were clicks all the way through the track, VG/VG- in my book. There were scratches which made the noise. "Unplayed", yeah right. I didn't even bother to listen to the whole side. The other one had loud ugly pops and even a small skip on the first track, took the needle right off after the skip. G in my book. This is what happens sometimes, I guess, when you taka a chance on an unknown eBay seller. I've had some good experiences with unknown eBay sellers before. But it's all a lottery. From now on I'm strictly buying from my highly dependable sources and professional, senior rare jazz vinyl sellers on eBay. No more unknown sellers. No more risk taking. Follow my advise and you'll be allright. I'm just glad I almost never buy from eBay. If that was my only source of rare jazz vinyl records, then this hobby would be trickier, to say the least. Dizzy's soundin' off, and it sure sounds great. I have a thing for Dizzy Reece. I think he's an excellent trumpeter. All his albums in the Blue Note 4000 series are favorites of mine. I set a task for myself, to collect all of them. I've almost managed the task. These albums are highly recommended by me, if you haven't explored them yet. The whole album is superb, all tunes are highly enjoyable. Very nice sound on this as well. This LP really exemplifies the wonderful full, clear, brilliant sounds you can enjoy when listening to an original 1st pressing Blue Note. How about the personnel on this gem? Well you can't go wrong with these cats: Dizzy Reece on the trumpet, Walter Bishop Jr. on the keys, Doug Watkins on the double bass and Art Taylor on the drums. It's quite nice for me, as I totally love Art Taylor's drumming, that he's on so many nice records. I think I've mentioned before I'm a drummer myself, so that is always close to my heart. I often listen to the drums and their different sounds when I listen to jazz. A particular drum execution, alone, can make me fall in love with a LP. Or get me into an LP, which is quite interesting. Art Taylor is one of my favorites, but I have others that I adore as well. Maybe I should create a new poll, top ten jazz drummers, what do you say? The early Blue Note 4000 series is very interesting to me. Many extremely good albums in there. I have managed to aquire just a few of them, but I'm really looking forward to hunting down some more. Do you have a favorite album/albums in the 4000 series? Please share. I have some top collectibles lined up for purchase in the coming weeks. I've also got my hands on a few early Pacific Jazz 10" albums that are on their way to me, so stay tuned! From a grey and rainy Stockholm, cheers! Chet in the big apple. Back from a great vacation to Mexico and Florida. Back to posting nice jazz vinyl rarities. I think I promised to post some stuff when I was away, but I never got around to it. But now I'm back. Sorry for the delay, but I guess I needed a total vacation away from everything. A quite pleasing Chet album here where he is flanked by some great sidemen, namely Johnny Griffin on tenor, Al Haig on piano, Paul Chambers on double bass and Philly Joe Jones on drums. The album comes with some relaxed and smooth soundin' trumpet playing as you'd expect of a Chet album. This really is a must if you're a Chet fan, like I am. I love Chet and he was one of my first loves when I started listening to jazz for real. I named my baby boy Chesney after him as well. There is a extremely nice mix of tunes here. All you want really, slow to medium, medium to up-tempo. Favorites at this moment are perhaps "Hotel 49" and "Solar". The ballad "Polka Dots and Moonbeams" is a sweet tune as well. There are quite a few early Chet albums I haven't got, especially on Pacific Jazz. I'm going to try and get a few of those soon. 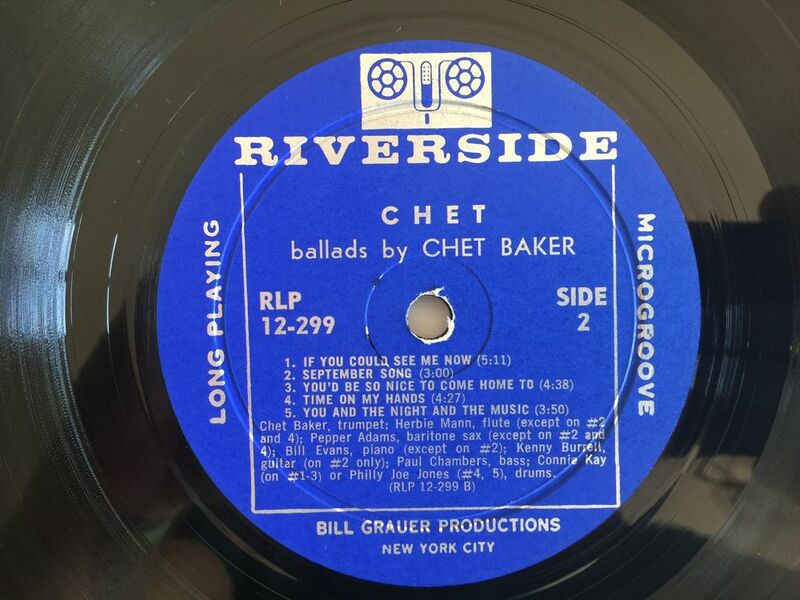 From Chet's golden era. I don't have that many Riverside albums to date, but I have my eye on a few that would make nice additions to the collection. There's a lot on the label that's really worth having. I tend to build my collection slowly but surely. I'm trying to get a lot of high-end stuff as soon as possible, cause the way prices are going they are only going to get more expensive in the coming years I believe. So that means some hefty price tags which in turn means not so many albums per year. I have a couple of really nice albums which I'm going to finalize deals for in the coming days. Stay tuned everyone for more selections from the collection, and thanks for hanging in there while I was away. Cheers! This is a nice album. Four tunes, no hassle, just straight up hard bop to enjoy on a rainy midsummer's eve like this. This album features both John Coltrane and Hank Mobley on tenor saxes. How cool is that? Very cool. Two of my favorite tenor players on one album. And the other cats on this are a formidable bunch; Elmo Hope on piano, Donald Byrd on trumpet, Paul Chambers on double bass and Philly Joe Jones on drums. I must say, I really dig the piano playing of Elmo Hope. I haven't really started to explore his other stuff in depth, but I know there's some really nice stuff to check out. For example BLP 5044, a nice 10". I'm quite keen on purchasing some more Blue Note 10" records. But back to Informal Jazz. The tunes are great, I dig them all a lot. The favorites perhaps being the ballad "Polka Dots and Moonbeams" and the up-tempo "Weeja". This LP is quite rare. I bought it quite a long time ago, when the covers where less important to me. The cover is a bit worn but that's ok. The LP plays beautifully. I'm happy with my copy. A really nice album to have in the collection. It's always nice to be reminded when I flip through the collection that I have this and when I see it I always get tempted to put it on the turntable. I guess, when I start to concentrate on collecting all the nice stuff Coltrane recorded, I'll be happy to already have one of the rarer ones he's on. I would recommend this one to all of you rare jazz vinyl collectors out there. A 1st pressing won't come cheap, but it's probably in the low medium range on the value chart of rare vintage jazz vinyl. I'm heading off to Mexico next week for a summer vacation which will also include Florida. At last, some relaxation. Looking forward to that. The weather at the start of the summer here in Sweden hasn't been the best, but Mexico will provide some much needed warmth and sunshine. I will post stuff during that time as well. After the vacation some new arrivals will be coming in. Some very, very nice stuff which I will put up on the site as soon as possible. Have a nice weekend and stay tuned for more rare vintage jazz vinyl. A nice Lexington label Blue Note that will not disappoint. High energy blowing session with Hank Mobley joined by two of the greatest trumpet players of the golden era, namely Donald Byrd and Lee Morgan. As you've probably already gathered by now, I love jazz trumpet and Lee Morgan in particular, which makes this LP a real treat for me. It's one of those beautiful, early Blue Notes with the famous Lexington labels and the vinyl weighs a ton. All the other attributes which a 1st pressing should have are also there. It has got the wonderful coated frame cover as well. All the things that makes collecting original 1st pressing Blue Notes such a lovely thing. You can really feel the history breathing when you play and hold this historical artifact. A great feeling. This LP is very rare. Quite difficult to find in it's original form with the coated frame cover present as well. My copy is in great condition and sounds awesome. I'm playing it right now. It's been a while since I last put it on the turntable. It's a great record. You feel happy when you listen to these tunes. Hank Mobley is truly one of the great tenor saxophonists. His tone is smooth, dark and luscious. Like a high cocoa content piece of dark chocolate. You just sip some bourbon, enjoy these amazing artists and let them take you away to a distant place. All tunes are very enjoyable. I dig "Barrel of Funk" a lot, as it plays at this moment in the background. The personnel on this LP are absolutely outstanding. Hank Mobley on tenor sax, Donald Byrd and Lee Morgan on trumpets, Horace Silver on piano, Paul Chambers on double bass and the fantastic Charlie Persip on drums. Could it get better than that? You'd be hard pressed to find a tighter ensemble. This is a LP from the era that you would want in your collection, no doubt. Straight forward hard bop at it's finest. Check it out if you haven't already. Really looking forward to add some new pieces to the collection, but they will have to wait a bit, but not very long. I have some really nice stuff coming up. Really good music. Really rare. More beautiful pieces from my collection are coming up, so as always, stay tuned. Feel free to leave a comment and let me know your opinion on this album or anything else. Cheers! Art Pepper on Jazz:West, a nice addition to any collection. This is a true gem. One of the best of the Art Pepper albums. A smooth, laid back west coast jazz album with lots of nice tunes. If you dig Art Pepper and his superb, cool approach to jazz, this is a must. The album bolsters a superb line-up with Pepper on alto sax, Jack Sheldon, whom I dig a lot, on trumpet, the wonderful Russ Freeman on piano, Leroy Vinnegar on the double bass and the superb Shelley Manne on drums. The very best of West coast jazz musicians, don't you agree? All the tunes are great, creating a nice mood and sound together, when you listen through the whole album. Almost all of them are Pepper originals. The favorite is perhaps "Minority". This is of course an original 1st pressing. It's quite desirable among collectors I believe. I'm happy to own a copy. These early Art Pepper albums are quite hard to get hold of. So if you find a copy, in almost any shape, try and get it. I have been on the hunt for the Pepper albums on Jazz:West, Tampa, Intro and so on for quite a long time and I've managed to find some of them and I'm very happy about that. They very seldom surface. Art Pepper is one of my absolute favorites, so I will try and get them all. Summer vacation is almost here, looking forward to that. I have some nice newcomers coming after that. So stay tuned for those. I will continue to post nice stuff that I have in the collection in the mean time. Cheers and have a nice rest of the weekend! RESULTS: Which one of these 20 top rarities would you like to own and cherish in your collection the most? Ok, so the results are in. The most coveted jazz album, of the 20 top rarities I selected for my readers to choose from, is: Tina Brooks "True Blue" (BLP 4041). In second place came Sonny Rollins "Saxophone Colossus" (PRLP 7079) and in third place came Tommy Flanagan "Overseas" (PRLP 7134). I own the Rollins album but not the other two. I only have the three original Metronome EP's by Flanagan, so I can enjoy the music, but I will try and get the Prestige release. The Tina Brooks album is great, and that is high on my want list as well. For me, the one on the list of 20 will have to be Lee Morgan Indeed! (BLP 1538). Thanks for voting! One of my favorite albums, a masterpiece. Art Pepper is special to me. I adore his playing and the early albums he made. This one is one of the best, if not THE best. Perhaps the best jazz album of all time, for me. Recorded in 1957. All tunes are equally superb. The sound is wonderful, perhaps the best sounding record I have. The mix is stunning. The details are great, with the drums especially sweet. The cover art is pure bliss. The picture is supposedly taken between Ewing Street and Fargo Street in Los Angeles where Art lived at the time. William Claxton took the photo of Art in a small grove of trees that bordered Fargo Street. The photos he took would be selected for use for the front cover of this album and the cover art of The Return Of Art Pepper on Jazz:West 10 as well. The group assembled for this album is of course superb, with Art joined by Miles Davis rhythm section consisting of Red Garland on piano, Paul Chambers on double bass and Philly Joe Jones on the drums. Couldn't ask for more, right? All four musicians are on top of their game on this album, although Pepper, I guess was not feeling 100%. Great performance and a milestone in Art Pepper's career. The copy I have has a superb vinyl and the cover, while a tiny bit worn is still in great shape. The cover is the 1st art cover with the blue heading and the pink line around the tunes on the back slick. It also has the frame on the bottom of the front. I'm really happy with my copy and it should be on the shelf of every jazz vinyl collector. We'll see if I could get my hands on a new piece before the summer vacation. If so, I'll put it up here on the site first thing. It's a piece I've been wanting a nice copy of for quite a while. Exciting. A coveted pearl, found at last. I've been searching for either BLP 1584 or 1594 for quite a long time. They seem extremely hard to find. Very rare in other words. Now, at last I've found one of them in good nick. "Smithville" BLP 1594 is the first Louis Smith album to make it into my collection. I'm of course ecstatic to have found one of my most wanted after a long time of searching for a good copy. My copy is in fine condition and it sounds great. Oh, that vintage Blue Note sound. Great cover art as well! I really like Louis Smith's trumpet playing and the tunes on this album are very enjoyable. Louis Smith only made a handful of albums back in the day, from what I've gathered, before he became a teacher. Four albums for Blue Note, two as a leader (1584 & 1594) and two as a sideman to Kenny Burrell (1596 & 1597). I intend to try and get the 1584 next and then maybe the Burrell albums. 1584 is a must but the others, well.. maybe. Louis Smith is probably quite underrated, at least to me. He plays with a lot of punch and feeling I think. Quite speedy as well. Great trumpeter, and I love trumpet as I've probably mentioned before. I dig all the tunes a lot. The favorites are maybe "Wetu" and "Embraceable You". The personnel are; Louis Smith (trumpet), Charlie Rouse (tenor sax), Sonny Clark (piano), Paul Chambers (double bass) and Art Taylor (drums). What a great line-up. I haven't listened to Charlie Rouse before from what I can remember. He's a superb tenor saxophonist. Truly great. I need to check out some of his other stuff as well. The Sound of Sonny sure sounds great. A great Sonny Rollins album. Nice laid back mood throughout. And the sound of this original, 1st pressing Sonny LP is superb. Jack Higgins is the engineer. Very nice recording by him. This is truly a must in any jazz collection. One of my favorite Rollins albums so far. I have far too few Riverside albums to date. There's so many great albums on this label. Can't wait to acquire another one. I love these early, white label pressings. They always seem well recorded and well presented. The personnel on this album are: Rollins (tenor sax), Sonny Clark (piano), Percy Heath and Paul Chambers (double bass) and Roy Haynes (drums). Being a drummer myself, I always listen careful to the drums, and I think Roy Haynes is great. Not my absolute favorite, but he has a nice approach to the drums. Actually, the way jazz drummers play, and the raw acoustic sound of the drums on these recordings from the 50's was one of the reasons I really got into jazz for real. And Sonny Rollins was one of the main reasons I got hooked on jazz. When I saw a concert on Swedish television with him, Henry Grimes and Joe Harris from 1959 recorded in Sweden, I thought it was superb and then I started listening to jazz more and more, to the point where I only listened to jazz. And here I am now, collecting jazz vinyl and loving every minute of it. If you haven't got this LP in your collection, make amends. It should have it's rightful place on your shelves. Preferably the 1st pressing of course. Stay tuned for more nice stuff! I've started to replace some images that I thought were not up to scratch. Some were dark and dingy and with not so appealing backgrounds. Some I had applied too much filters on. So, enjoy the new images! Don't forget to vote for your most coveted jazz collectible that you'd want to have in your collection below! POLL CLOSED. Which one of these 20 top rarities would you like to own and cherish in your collection the most? I thought it would be interesting to see which one of 20 top rarities my readers would like to own the most and cherish in their collections. So, choose 1 of the 20 below! A very rare live LP worth checking out. 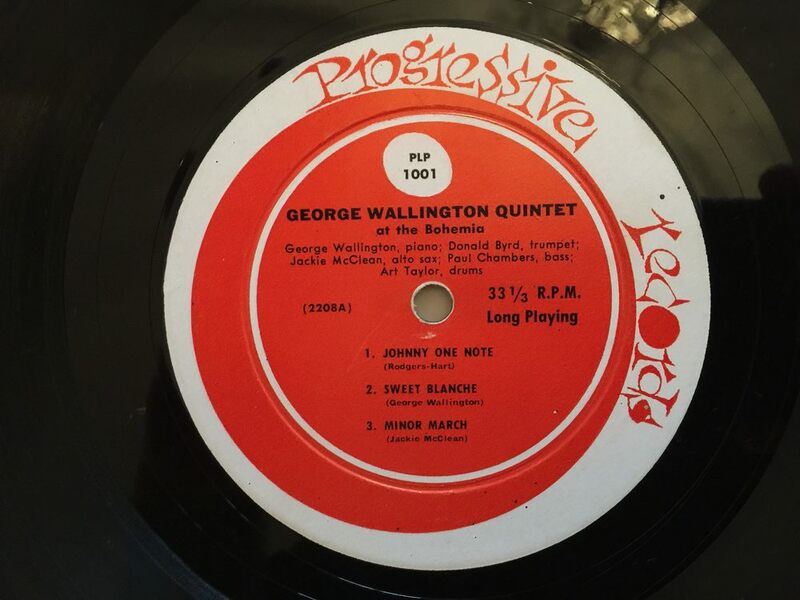 Superb album with George Wallington playing at the Café Bohemia in New York on September 9, 1955. The all-star lineup consists of the following: George Wallington on piano, Jackie McLean (says McClean on the back slick. Well, he sure does play clean), Donald Byrd on trumpet, Paul Chambers on double bass and Art Taylor on drums. Doesn't get much better. The sound on this is suprisingly good for a live recording from the 50's. But you don't expect less from Rudy Van Gelder who recorded this wonderful album. This original 1st pressing is very rare to say the least. Extremely hard to find, and you almost never see it for sale. Happy of course to have it in the collection. Just listened to it, and it's a nice set of tunes on this. Favorites are "Jay Mac's Crib" and "Minor March". An energy filled performance which makes you wanna go back in time and sit there at The Bohemia, sip a drink and enjoy some magic. You should definitely check this one out if it's new to you. An original is maybe too hard to acquire, for it's rarity and price tag, but this music should make it's way into your collection, original, reissue or in another format. Superb stuff. Make sure you stay tuned for more great items from my collection. Have a great Sunday! A relaxing, moody and romantic Chet album. Very relaxing LP by Chet Baker. Chet is one of my first loves in jazz. This record is one of his best. It consists of nice ballads played beautifully by the following personnel: Baker (trumpet), Pepper Adams (baritone sax), Herbie Mann (flute), Bill Evans (piano), Kenny Burrell (guitar), Paul Chambers (double bass), Connie Kay and Philly Joe Jones (drums). Chet's lyrical, smooth, romantic approach to the trumpet is flourishing here. He's a ballad master, and really captures a nice feeling on all the tunes. I love his style of playing, all the way through his entire career. He plays with feeling. Pepper Adams on the baritone sax is truly great on this LP. I absolutely love his playing as well. I have far too little material by him in the collection. His playing is robust, yet lyrical. His tone is warm and takes a lot of space. I have some other records which he's on, but I need to explore him further for sure. He's really enjoyable and makes the baritone a really pleasant instrument to listen to. The other cats are top notch as well, of course, with such names as Bill Evans, Paul Chambers, Philly Joe Jones and Kenny Burrell, how could you go wrong? Even the concept of jazz flute, which I haven't been the greatest fan of, Herbie Mann makes me a believer of. At least on this album. If you're looking to collect a few Baker albums and want to pin point some of the very best material, this album is a very nice start. It's Baker at his best, playing lyrical, with a lot of feeling and it puts you in a very relaxing mood, perfect for a late, lazy Sunday afternoon.